The Virginia Zoo was the absolute perfect location for Daniel & Ashleigh to tie the knot! Let us also not forget the gorgeous wedding we had that day. After days of rain the sky cleared and the sun shone for a gorgeous Sunday wedding. The Virginia Zoo in Norfolk accommodated their wedding and Daniel & Ashleigh were able to party like animals in the perfect setting! We loved taking them around to see the monkeys, giraffes, and more. We even made sure to get a picture of Daniel with an owl. He reminds us all of Harry Potter so it was fitting to get a photo of one of hedwigs friends. Luke and I are excited to shoot more zoo weddings in the future! These two are so spunky and fun. I love the way they interact with one another. It is nothing but jokes, silly faces, and laughter. Their personalities compliment the other so well and watching them interact makes you want to join in with them on their fun and games. Sometimes a wedding day can bring unnecessary stress and headaches. The couple wants to be sure everything is just perfect and right. They have waited their whole lives for this moment and so I totally get it. However, these two just rolled with the flow. Yes there were some nerves but all in all these two embraced the day with open arms. It is just who they are and because of this their wedding day was absolutely perfect. Zoo weddings are so much fun! Luke and I had never had the opportunity to shoot a zoo wedding. Up until now, we had no idea what we are missing out on! I think it is genius to get married at the zoo! Most couples worry about cocktail hour. Making sure there is enough to eat, drink, and entertainment. They understand that pictures are important, but they don’t want to keep their guests waiting. However, with a wedding at the zoo, your guests get to go look at all the animals during cocktail hour. It is a win win for both the couple and their guests! I thought it was pretty cool! After all the pictures, these two and their guests partied the night away. It was such a fun evening and we couldn’t have asked for better weather! Daniel & Ashleigh, what a joy it was celebrating with you guys! We love the way you love each other and laugh at each other. We look forward to capturing many more life moments with you and it will be such an honor to watch your family grow! 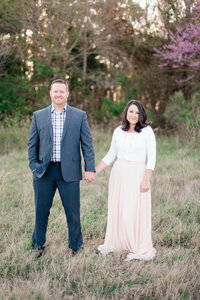 To See Daniel & Ashleigh’s Engagement Session Visit Here!